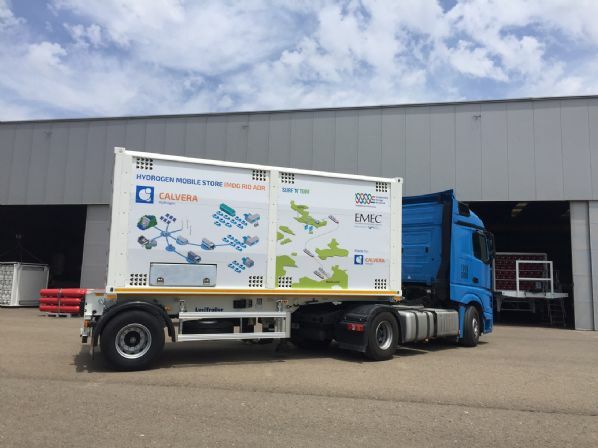 The World Hydrogen Energy Conference at Zaragoza is the venue for supplier Calvera Macquinaria to put on show the first of the lightweight units that make hydrogen transport in Orkney possible. Existing hydrogen trailers are too large and too heavy to use on narrow rural roads such as Orkney's more remote islands. Calvera's design – produced specifically for Surf 'n' Turf – is the first that is light enough to comply with a 25 tonne weight limit, while still meeting all the safety requirements of transporting hydrogen by sea. Project partners ITM Power and EMEC are in Zaragoza to help tell the Surf 'n' Turf story to a global audience. Surf 'n' Turf is backed by the Scottish Government's Local Energy Challenge Fund, administered by Local Energy Scotland. Surf 'n' Turf is an innovative community renewables project in Orkney. It will generate hydrogen from tidal and wind energy, hence Surf 'n' Turf.